Catholics have largely ceased to talk about worship. Some have relegated it to just a style of music and prayer ("praise and worship"), or assumed it is just a feeling we might sometimes feel in private prayer (like thankfulness), or have just abandoned it altogether as an unmodern idea. 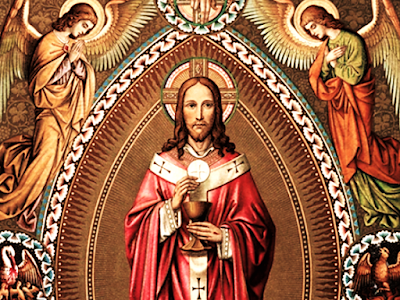 But at every Mass we worship the Father because we are in the Son, and so his high-priestly worship—on the cross and in the heavenly sanctuary—are our worship. We are "sons in the Son", therefore we are "priests in the High Priest". but one who has similarly been tested in every way,yet without sin. The author of Hebrews doesn’t just focus on Jesus as king, but heavily on him as priest. He also see the Ascension as not just Jesus leaving us, promising the Spirit, and then waiting to come back at the end of time. He sees the Ascension as the moment the real High Priest enters the Real Sanctuary. And this is why he can intercede for us at the throne. That’s a priestly role, not a kingly one. 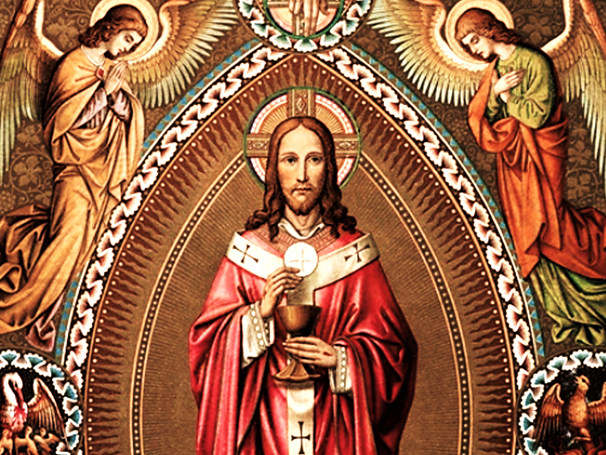 We hear about Melchizedek in Eucharistic Prayer I. Jesus is a priest, but not in the line of the Aaron and the other Levites; remember he is from the line of David (tribe of Judah), but the author says he’s a priest in the way Melchizedek was, who was also a priest and a king. if that were so, he would have had to suffer repeatedly from the foundation of the world. Hebrews says that the sanctuary Moses made with the desert tabernacle and that Solomon made in Jerusalem were just rough copies: Moses saw the real heavenly sanctuary and is told to imitate it. But at the Ascension Jesus goes into the real and better sanctuary and offers himself and his worship. And “Not repeatedly”. The high priest would go through the veil (remember this phrase) into the Holy of Holies once a year on Yom Kippur, The Day of Atonement, to sprinkle blood and say the sacred name. But that doesn’t actually take away sins, so he repeats it yearly. Jesus only offers himself once. Protestants sometimes accuse Catholics of thinking we are re-sacrificing Jesus every time we are at Mass. No. There is one sacrifice, but we come back to it again and again. Every priest stands daily at his ministry, offering frequently those same sacrifices that can never take away sins. Here we hear again about the once-for-all sacrifice and Jesus’ intercessory role. And then the line about the footstool brings us back to Psalm 110 again. Earth Thy footstool, Heaven Thy throne. Why did we just do that scripture search? What Jesus did on the cross wasn’t just this great act of love. Wasn’t even just an act of self sacrifice for sins. Or even an just example of how we have to empty ourselves in humility. Jesus makes a different act of worship, with a different kind of victim, on a different hill. Myself and another seminarian were in the group that had a paper presented by a Presbyterian on worship, focusing on the kind of music chosen in services. All we two did was just follow their lead: songs, prayers, postures, instruments…. Oops, we messed that up! We would’ve probably said if asked what we do at Mass: Well, you go to pray. Or we would’ve said, and essentially did say, that worship was this individual thing that a person may do at the Mass. Or worse, we might have just relegated it to being a feeling, like praise or thanks sometimes are treated. But that is not what the Christian tradition tells we are to do: to only give thanks when we are feeling thankful, or to praise individually when are hearts are full of praise. When we come together we DO praise and thank and worship together—objectively—and hopefully as a result of doing it we begin to feel the feelings of praise and thankfulness. Some years back Miss Manners was asked by a parent if they should make their kids write thank you letters for gifts if the kids didn’t real feel thankful for them. MM insisted yes. We don’t write them because we feel particularly thankful. She said something like: I have written thousands of thank yous, and I hope that eventually writing them will make me be as thankful as what I wrote. We write them so we can start to grow into the feeling. CS Lewis says something similar about our Christian virtues. We don’t need to feel courage to love or faith. We do the actions in the hope that the feeling will come along later. Same with worship. We do it (and praise and thanks) so that the feeling of those will eventually catch up to what we are doing. That is one of the reasons I have enjoyed this past year of us praying together with the priest ad orientem. Because, again, those are individual things. That’s the whole thing we are trying to clarify, we are worshiping the Father in Jesus. His worship is our worship. Here’s the Trinity <triangle of fingers> Father, Son, and Spirit. Sin divides us from God. There is a chasm there. And we are on the other side. So while we are still sinners, the Spirit swoops down, and scoops us up, and puts us—through baptism—into Jesus. We are in Christ. Whatever relation he has to the Father and Spirit, we have. We of course disagree with him. So, the Letter to the Hebrews is a thing we need to revisit from time to time to remind us why we are here. And we do that with Jesus and in Jesus the way he did that on the cross and the way he does when he enters that perfect sanctuary in heaven.